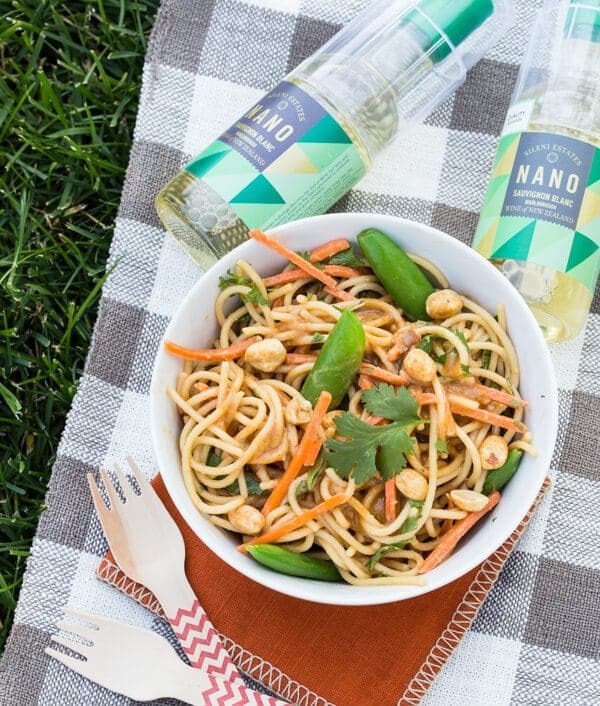 Summer nights don’t get much better than dining al fresco with a make ahead Sweet and Spicy Peanut Noodle Salad and a cold glass of Sauvignon Blanc. Make ahead dinners have saved my hide more than once this summer. With baseball games and practices 3-4 nights a week, an easy dinner has become a necessity in our house. This Sweet and Spicy Peanut Noodle Salad fits the bill perfectly and has quickly become a family favorite. What’s great about this salad is you can make it ahead of time and serve it cold or at room temperature. How’s that for versatility? Filled with peanuts, soy sauce, sesame and fresh veggies, it’s a satisfying meatless meal that is ideal for hot summer nights. Craving a little more protein in your dinner? Toss in some grilled chicken or shrimp to round out your meal. Now anyone who knows me well knows that I love a good glass of wine with dinner. 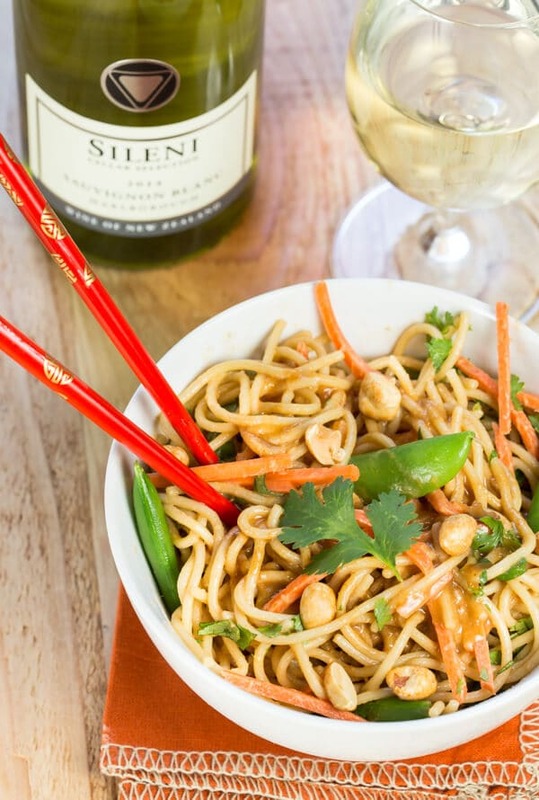 The clean, crisp Sauvignon Blanc from Sileni Estates is absolutely delicious with this spicy sweet noodle dish. But dinners on the go don’t always make enjoying quality wine an option. Fortunately Sileni Winery created a portable way to enjoy their award-winning Sauvignon Blanc and Pinot Noir. The adorable Sileni NANO is an all-in-one fun (AND unbreakable AND recyclable) cup and bottle combination that goes anywhere. Perfect for picnics, tailgating or wherever you enjoy your al fresco meals. Plus the NANOs are filled with the exact same wine as the large bottles. A quality wine in a portable package paired with a make ahead meal? Sounds like a win-win to me! Place all ingredients in a small bowl and whisk to combine. Set aside. Cook spaghetti al dente according to package directions and rinse with cold water. Add to large bowl and toss with olive oil so noodles don't stick to each other. 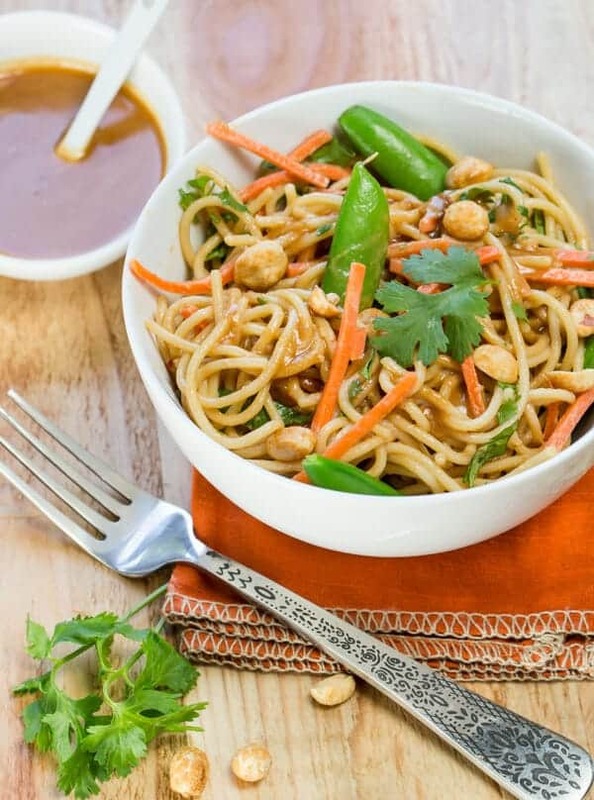 Add sugar snap peas, carrots, green onions and peanuts to noodles and stir in desired amount of peanut sauce. Add cilantro and mix well. Serve cold or at room temperature. I save a couple tablespoons of the peanut sauce and add it right before serving. Disclaimer: This post is sponsored by Sileni Estates. All opinions are my own. Thanks for supporting the companies that make Garnish with Lemon possible. You just made me crave peanut noodles! Printing the recipe now. And how clever is that wine bottle! I’m a big Sauv Blanc fan, so will look for that brand at the store. Thanks, Dorothy! It’s such a fabulous combination of flavors! I adore Asian noodle salads!! Yes please! This looks sooooo good. However, since we have peanut allergies at my house, I’d make it with sunflower butter and add some sunflower seeds for crunch. I think it would still work. Love the idea of serving cold and with some grilled shrimp or chicken, too! I am a huge fan of sauvignon blanc and I need to try this wine! This salad looks amazing, can’t wait to make it! You will love it, Lauren! Asian flavors are my absolute favorite – and this is perfect for a hot summer night with a glass of that wine poolside! Sounds like a perfect evening to me! Peanut noodles are an absolute favorite of mine, especially ones I can make ahead and break out for a quick lunch or dinner. You mentioned chicken or shrimp, but a delicious grilled tofu would also be a great protein topper. These Asian noodles look so delicious! I love a good Sav Blanc paired with a sweet and spicy dish. Yum! I love all of the flavors in this dish! I love a good glass of wine with dinner, also! Oh my gosh! This sounds like my favorite salad! SAUVIGNON BLANC would be perfect with it too. I think I just found dinner for tonight! I need to try that wine too!! I love a good Sauvignon Blanc! This salad looks awesome! Wine always makes dinner more relaxing too. Lisa this salad looks dreamy!!! I love Thai peanut everything, and I love that you can make this in advance!! You and I both went to the same school on picnicking – noodle salads like these are perfect and no picnic is complete without wine (even when I was in high school I always brought along a bottle of sparkling grape juice. What can I say?) I’ll definitely have to look for those little bottles – so awesome that they have the built in cup!